Spring is here! And with it comes so many different venues for learning with preschoolers. 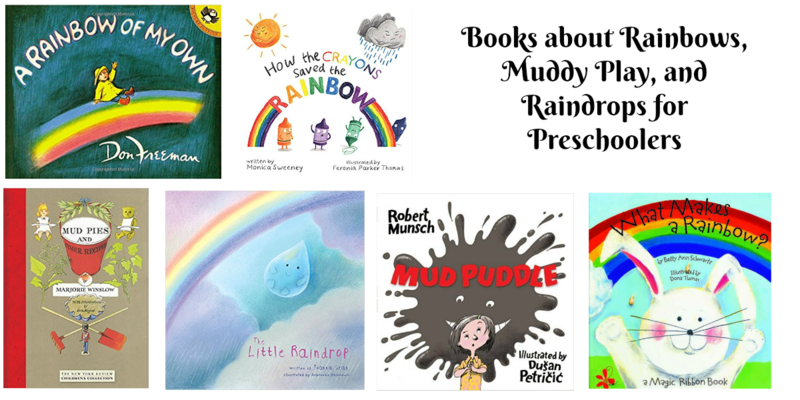 The changing landscape, plants and flowers, mud and rain, birds and bugs… The list could go on and on. Add all of those concepts together and you’re in for one fun month. 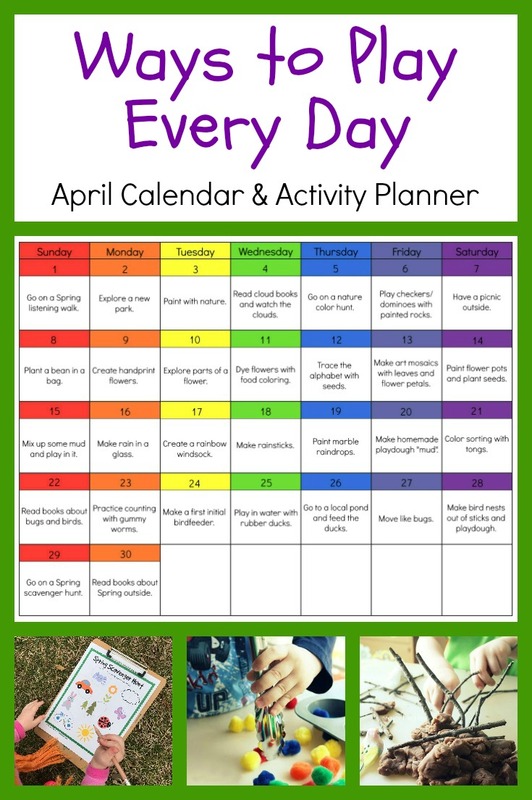 Please enjoy this free printable calendar of spring activities that you can do with preschoolers. 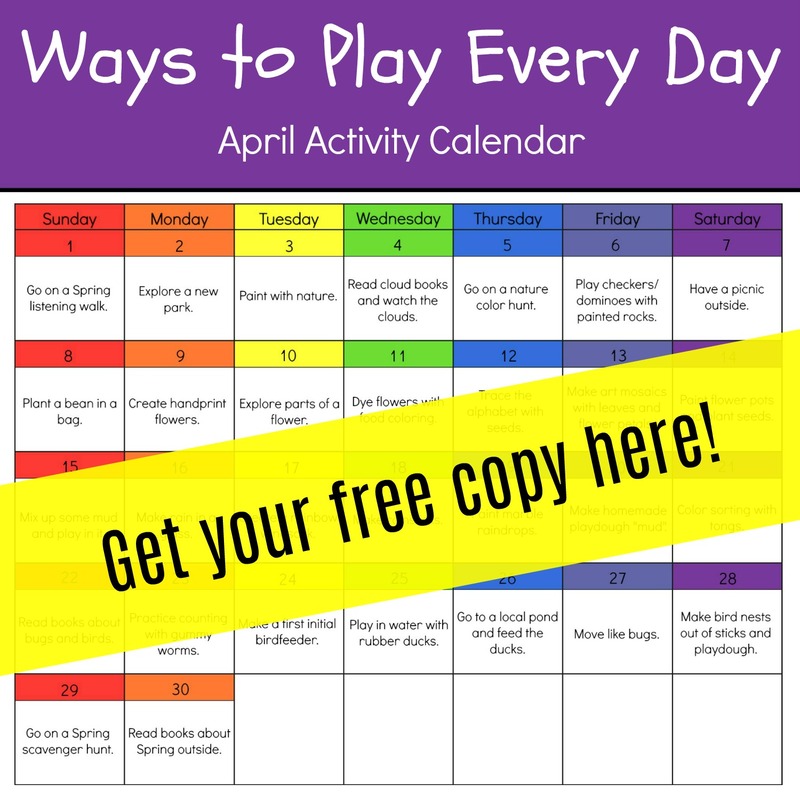 Ways to Play Every Day – A Free Printable April Activity Calendar of for Preschoolers! This free Spring activity printable can be used in a variety of ways. Parents can use it at home to encourage daily learning activities that bring the family together. Educators can use it to supplement and/or inspire curriculum in the classroom. Below you will find a breakdown of each activity in the calendar, complete with links to printables, activities, and book lists that you can use to complete them. 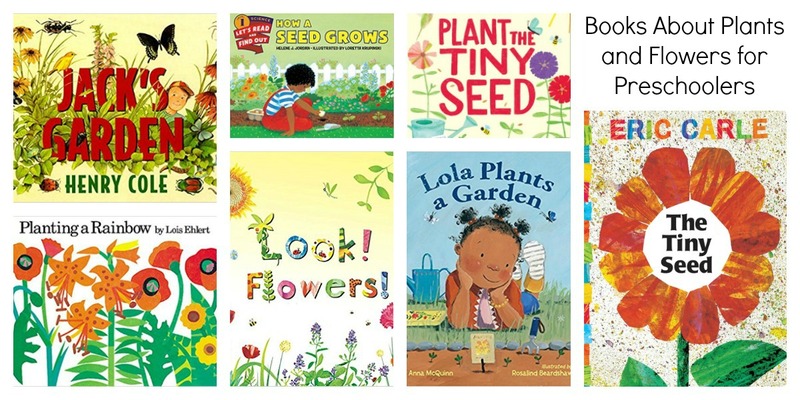 Go on a Spring listening walk: Take a walk around the neighborhood and encourage children to listen for the sounds of spring. These could be birds chirping, sprinklers running, lawnmower engines, children playing, etc. Children can notate what they hear with this free printable. Explore a new park: Take advantage of the nice weather and visit a new park to play at. Paint with nature: Clip pinecones, flowers, leaves, feathers (and any other spring-related item you can think of) to clothespins. Set in these natural brushes in the art center in place of paintbrushes and encourage young learners to create. 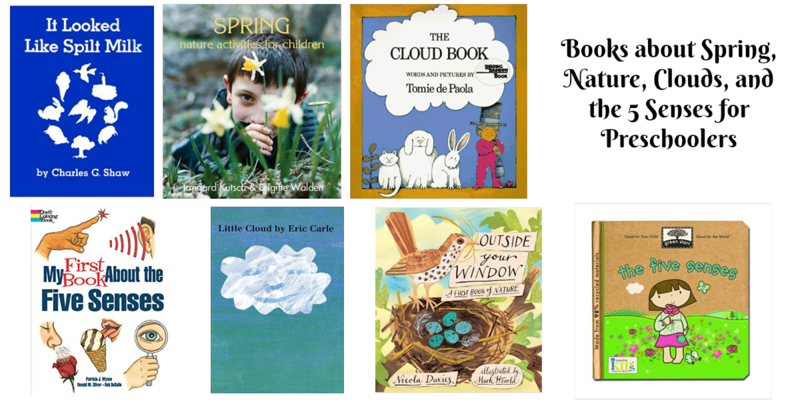 Read cloud books and watch clouds: Set out a blanket and read books outside about clouds. Then lay back and watch the clouds move. Ask children if they see any particular shapes in the clouds. Get more ideas for activities here. Go on a nature color hunt: Take a walk and look for different colors in nature. Children can check off boxes on a color chart or match colors to paint swatches from the hardware store. Play dominoes with painted rocks: Paint rocks with colors or dots to create dominoes that children can play with. Get a full tutorial on this game here. Have a picnic outside: Take snacktime or lunch outside. Spread out blankets and eat outdoors, enjoying the sunshine and fresh air. Plant a bean in a bag: Wet a paper towel and set a bean seed on it. Place it inside a clear zip bag and tape to the window. Watch as it sprouts over the rest of the month. Find in depth instructions here. Create flowers out of hand prints and paint: Make flowers that have children’s hand prints as their petals. Just coating hands with paint, then stamp around in a circle like this. Parts of a flower: Explore the various parts of a flower using this tutorial. Food dye flowers: Place several white flowers in bottles filled with water and food coloring. Watch over the next few days as the flowers turn the same color as the water they’re in. Full details here. Trace alphabet with seeds: Reinforce the alphabet by covering the ABCs with sunflower seeds. Get free printable ABC sheets here. Art mosaics with leaves and petals: Create beautiful mosaics by letting children glue down leaves, petals, and grass in patterns on paper. Paint flower pots and plant seeds: Paint small terra cotta flower pots with colorful designs and plant flower seeds or small flowers. 15. Mix up some mud and play in it: Set up a fun and messy sensory experience by mixing up some mud and placing it in the sensory area. Children can play with it with bare hands or use tools to move it around. 16. Rain in a glass: Create rain in a glass using this quick and easy technique. 17. Rainbow windsock: Make a rainbow windsock with multi-colored crepe paper and cardstock paper. Hang in front of a window and let the spring breeze make the colors dance. 18. Make rainsticks: Create rainsticks out of paper towel rolls and rice to mimic the sounds of spring rain. 19. Marbleized rain drops: Use this shaving cream painting technique with blue food coloring on raindrop shaped paper to create multidimensional raindrop art. 20. Make homemade play dough “mud”: Cook up some homemade playdough, toss in some construction vehicles, and play in the “mud”. 21. Rainbow tong color sorting: Practice color sorting and fine motor skills with this rainbow tong activity. 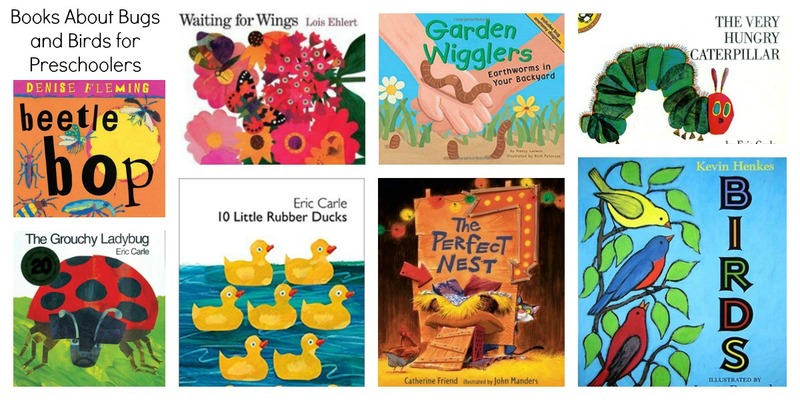 Read books about birds and bugs: Eric Carle has some wonderful books that feature birds and bugs. See the list here. Gummy worm counting: Practice counting with gummy worms. First initial bird feeder: Cut paper plates into the first initial of each child. Cover plate letters with sunflower seed butter and sprinkle on birdseed. Hang outside to feed the birds. Water play with rubber ducks: Fill up the sensory table or small tubs with water. Add in some rubber ducks and let children play. This type of activity is very open-ended in that children get to decide what they get out of the experience. It can lend itself to sensory exploration and/or dramatic play as they make up pretend play scenarios for the ducks. Go to a local pond and feed the ducks: This can be a very fun activity. Just remember that bread is not safe for ducks. Instead, feed them canned corn (drained and rinsed), lettuce, duck pellets, or chicken feed. More ideas on feeding ducks here. Move like different bugs: Encourage children to wriggle like a worm, hop like a grasshopper, buzz like a bee, and curl up like a roly-poly bug. Ask them to name a bug and show how it moves. Play dough stick birds nest: Build a nest for plastic birds using the brown playdough from last week and sticks. 29. Go on a spring scavenger hunt: Take a walk and look for signs of spring. Cross them off of this child-friendly spring scavenger hunt list. 30. 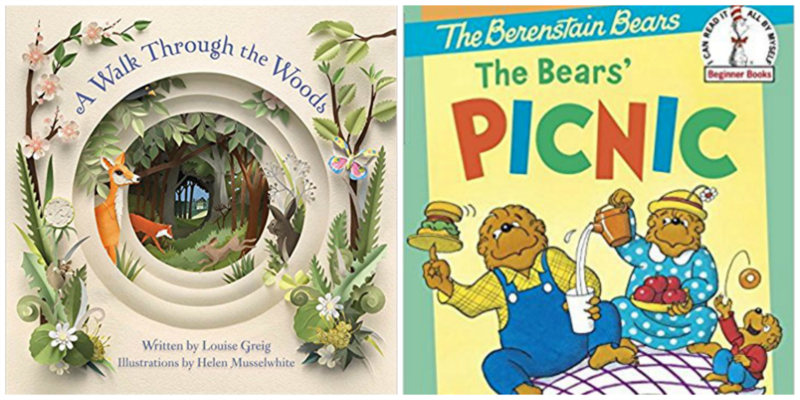 Read books about spring outside on a blanket: Gather favorite books about spring and go outside to read them on a blanket while you enjoy the fresh spring air. Let this fun calendar inspire you to play every day with these simple activities! 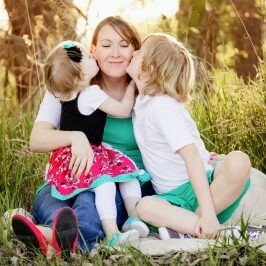 Thanks for sharing; your posts are really great and make it easier to carry out fun activities in preschool.